If Saudi Arabia and the UAE are worried about Imran Khan’s victory in Pakistani elections, then the concerns of the United States, Britain and other European countries are more serious; because this man is an ardent opponent of US regional policies, and condemns Israeli terrorism. Senior Arab journalist Abdel Bari Atwan, the Editor-in-chief of Rai al-Youm, has written an opinion piece on the new political developments in Pakistan and its connection to the Middle East developments. In this article, Atwan says that Saudi officials are seriously worried about the defeat of their allied party, the Muslim League, led by Nawaz Sharif in the Pakistani parliamentary election, and the victory of his stubborn rival, Imran Khan, a former cricket player who does not want to be friends with Saudi Arabia and opposes the Yemeni war; and at the same time is after strong ties with Iran. Nawaz Sharif is now behind the bars on corruption charges, just like his other Saudi allies, including former Malaysian Prime Minister Najib Abdul Razak. Mahathir Mohammed after taking office as prime minister of Malaysia decided to withdraw all the Malaysian forces from the Saudi-led coalition in the war against Yemen. Imran Khan is also expected to do the same thing. He may withdraw from the coalition that the Saudi Crown Prince Mohammed bin Salman formed in 2015 with the participation of 41 countries to launch the war against Yemen. Imran Khan, after leading his country’s national team to win the 1992 Cricket World Cup, received a Master’s degree in Economics from Oxford University in 1995. 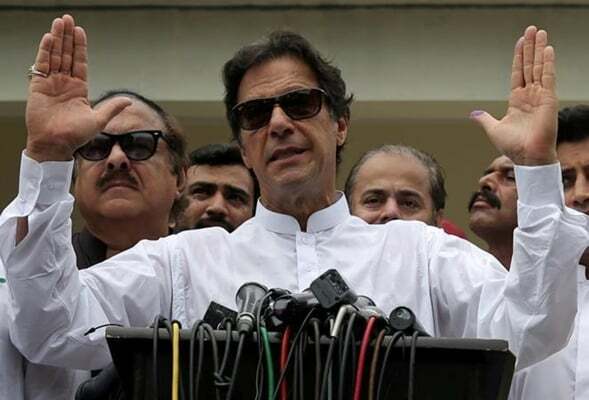 He and his party, Tehreek-e-Insaf (PTI) have been accused by the opposition parties of electoral fraud and turning results in his favour by involving the army. However, one should not forget that he is very popular because of his electoral program that seeks justice for the people of Pakistan through the establishment of an independent judiciary, respect for human rights, the rule of law and the fight against corruption. In Pakistan, as in many Third World countries like Iraq, Syria, Algeria, Egypt and Turkey (before Erdogan), the army has a prominent role in maintaining the security and stability of the country and the election of leaders. It is enough to point out that the Pakistani army ruled for half of the life of this independent state. So, in the opinion of many Pakistani experts, the military’s support for Imran Khan, the future prime minister, will be the source of his power, not a weakness for him. If Saudi Arabia and the United Arab Emirates are worried about Khan’s access to power in Pakistan, then the concerns of the United States, Britain and other European countries are greater. Because he is completely opposed to US policies in the Middle East, and strongly supports the cause of Palestinians and participated in many political activities that were held to condemn Israeli terrorism during his studies at Oxford University. After retiring from sports and establishing the current political party (PTI), he continued this tendency, and even his first wife, Jemima Marcelle Goldsmith, who was a British woman, converted to Islam and followed this approach. She heavily criticised Israeli attacks on the Gaza Strip in her articles and published them in the Guardian. The Saudi prince “Khalid bin Abdullah Al Saud” was among the most prominent figures in expressing Saudi Arabia’s concern over Khan’s victory. In his Twitter account, he described Imran Khan as a follower of Iran and a representative of the Iranian city of Qom in Islamabad, but he later removed this tweet. Imran Khan, who is now working to form a coalition government and take an oath of office in mid-August, will try to change Pakistani policies completely if things go according to his will. As he has expressed his willingness to have good relations with India to hold meeting with India’s leader to resolve the Kashmir crisis, he has also vowed to work with President Ashraf Ghani on peace in Afghanistan, and establishing relations based on good neighbourly ties with Tehran. He also expressed his readiness to withdraw from the US coalition to fight against terrorism. Saudi Arabia and the United Arab Emirates, as well as President Trump, are worried because the new Pakistani prime minister will never be a “puppet” like his predecessors, and would restore his country’s status as a major nuclear power in the region; a role that was ignored under corrupt prime ministers, the last of which was Nawaz Sharif. We have no choice but to wait and see what happens.